Managed to do a little work on the mechanics of my “JLH evo” concept allowing you to get an idea of what the end result will look like (when it’s eventually finished…). I’m still figuring out a final chassis design so I may well leave it in this state for quite a while, but at least the mechanics seem to fit together as planned and there’s enough room to run the wires. The baseplate size is app. 170 x 230 mm per mono block. The extra PCB is a CRC-regulator stage that I will add to reduce the noise and ripple from the switching PSU (a Mean Well EPP-150-27). The advantage here is that the ripple frequency from a switching power supply is very high (typically 65-100 kHz) so the attenuation is much, much greater than at the normal 100/120 Hz ripple from a linear supply – meaning in other words that it’s possible to get away with much smaller filtering caps than a usual class A amp. I’ve been playing with the (somewhat) unusual combination of a class A amp and a switching PSU before (here). The previous version worked quite well, but even as I was building it I though that there might be scope for optimisation and for making it smaller – which to be honest was my goal all along. I’ve also been looking at getting some more quiet fans, but I’ve now realised that the most annoying noise from fan-cooling doesn’t really come from the fan itself but from the sound of air rushing through the various holes in the enclosure. Once I’ve done the final design I’ll have to test what can be done to keep the amps as quiet as possible. The noise level on the first iteration was OK, but definitely with room for improvement. 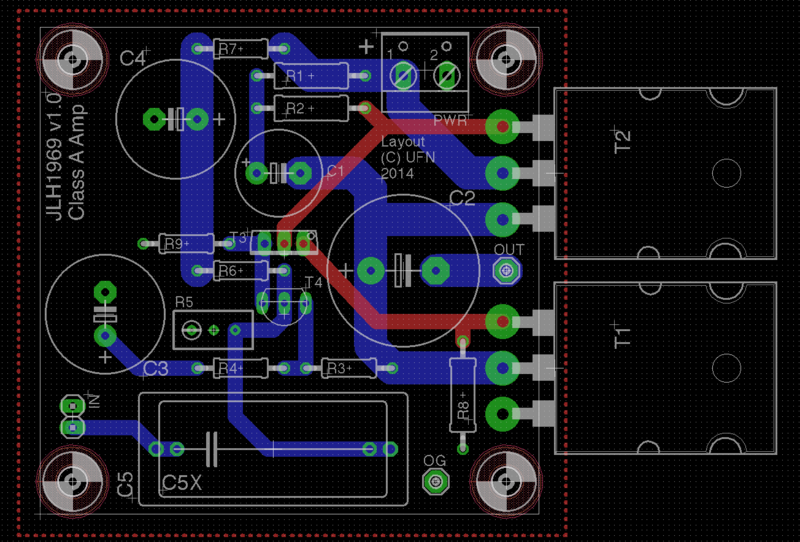 We’ll do this one quickly then: Standard JLH1969 Ebay-board with upgraded components and better transistors (MJ15003). Fan-cooled heat sink with temperature control (we’ll see how well that works…). Industrial-grade 10A switching PSU per channel. Monoblock configuration in Modushop GX288 chassis. The PSUs (Artesyn NLP250) are overkill for this application but they were cheap (surplus items). And besides, more is better – right? Not necessarily here though, because some of these industrial-grade PSUs have a reputation for being extremely noisy at low power output. As a class A amp, the max. current consumption of the JLH should be twice its quiescent current (so app. 2.6A) and each PSU will deliver four times that before the limiter kicks in. Whether this is a real problem here or not I don’t know yet, but there are no audible artifacts at all so I am not overly concerned right now. The heat sinks were also surplus items and I am not sure exactly what their rating is. At full speed the fans are a bit too noisy for my liking (the heat sinks add some flow noise as well) but if the fan speed is lowered a little I don’t think it would be really noticeable once the amps are seated in a rack. For the time being I have installed some small temperature speed control boards for the fans (hence the somewhat messy wiring) but depending on how well that works and how hot the amplifiers get, I may go back to fixed resistors. 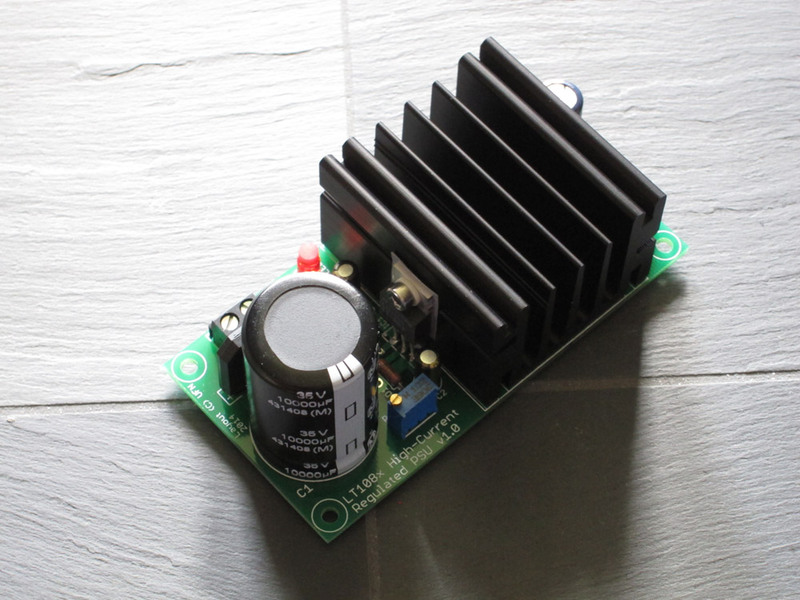 The PSU already has a dedicated 12V fan output so the resistor doesn’t need to drop a lot of power. The heat sinks had a cutout in the side that was just too narrow for the angle brackets to fit into. The best solution would have been to mill the ends of the brackets to fit the cutout so there is only one contact surface. Unfortunately I don’t have access to a mill anymore so I had to find another solution: A copper “heat slug” to fill the gap. Just a piece of copper bar in the right thickness cut to size and with thermal grease on both sides and that should provide the best possible thermal transfer under the circumstances. These “little helpers” are small supporting boards I have developed for my various audio projects. I have a few different ones and I don’t think they are really “big” and sophisticated enough to warrant a post for each one so I’ve decided to lump them together in a few groups instead. The first collection is PCBs for mounting Alps (and a few other types, including the Noble I have used in some of the pictures 🙂 ). Included are boards for different types of potentiometers namely stereo without motor and quad with and without motor (i.e. Alps types RK27112 and RK27114/RK27114MC). For the unmotorised version there are two variants: “Preamp” groups input and output terminals together and “Breakout” groups the individual decks of the pot together. The “preamp” version is used when you want the signal to flow through the pot (such as in a pre-amp), whereas the “breakout” version is used when you want to insert the pot into an existing circuit, i.e. for wiring an off board pot to an amplifier PCB that has onboard space for it. This distinction is mainly to help simplify wiring – unless the circuit has a really strange design with respect to grounding, you can of course use the boards interchangeably. Small… I don’t want to list them all here. The biggest board is the quad motorised which measures 3.5″ x 1.75″ (app. 89 x 45 mm). The boards have been tested in v1.0 and for a couple I made some cosmetic changes, including changes to the footprint of the motorised quad pot, to upgrade them to v1.1. The stereo boards have a four-hole footprint to fit various pots that use that configuration, but the last set of pads isn’t connected to anything so will not work directly with a loudness tap. The “preamp” style boards have a ground plane and a ground pad that can be used if you grounding scheme requires the shaft of the pot to be grounded. Use a piece of wire connected from the ground pad to either one of the screws on the back of the pot or soldered to a ring terminal wedged between the pot and the chassis. On the motorised quad pot the shaft is connected electrically to the solder pins for the motor housing, so if you want to ground one of these you only need to connect a small jumper on the underside of the board from one of the housing pins to the ground pad – no messy wiring needed. As usual, please remember to consult the manufacturer’s datasheet as well. 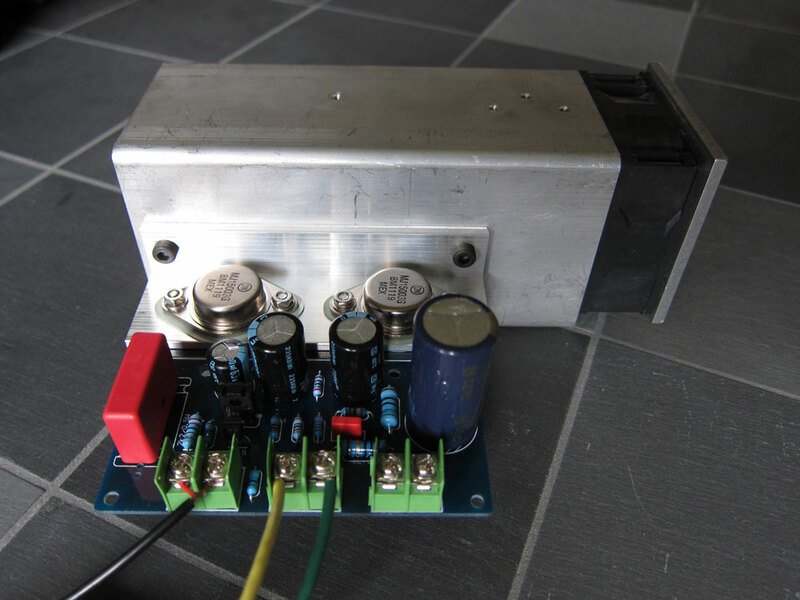 This is the project files for my version of the JLH1969 amplifier as shown here. The files for the matching PSU will follow shortly. The board measures 2.25″x2.3″ (app. 57x58mm). EDIT 17th Jan. 2016: Added v1.1 of the files in a separate link below. Minor tweaks to the board and the download now includes a basic BoM as well. No. I have used MJL21196 output transistors because I had them, but versions of the MJE/TIP3055 should be OK as well as long as they are in suitable (meaning TO-247 or TO-264) packages. Do not be tempted to use faster transistors such as the MJL/NJL3281-types as the amp will most likely not be stable with these. Have a look at the TCAAS page on transistor substitutes for more info. In my opinion the output cap should be 4700uF or larger, even with an 8 ohm load. Even if the supply voltage is 27V, I’d be comfortable with using a 25V cap in this position. All the other electrolytics should be 35V or higher. Heat sink T3 as it might get hot. You’ll probably not be able to find a standard heat sink that fits. so my recommendation would be a small piece of bent aluminium or copper with a hole tapped in it for easy mounting. Raise the R2 resistor 5-10 mm above the board for cooling (I haven’t done this in the prototype version but it gets quite hot). The footprint for the input transistor is for a 2N3906 as described in the original BoM, but other types can be used as well. An easy to get choice is a BC560C which needs to be turned 180 deg. in order for the footprints to match. As usual, both TCAAS and this diyaudio.com thread contains lots of worthwhile information. As promised, here is the matching PSU for the mini JLH1969 amp. Based (roughly) on the PSU designed for the JLH1996 amp, this is a single-rail regulated PSU based on an LM1084 (or LM338) regulator giving a 5A current limit. The board measures 5×10 cm and is intended to be used for one amplifier channel. The onboard heat sink is a Fischer SK68/50 which should be enough for an amp that draws app. 1.3A, especially if the low-drop LM1084 regulator and a suitable transformer is used. Even though I have already built a Linsley-Hood JLH1969 clone and another is in the works, I still wanted to make my own layout for this classic amplifier – and here it is!. The board measures measurements are 2.3″ by 2.25″ (app 57×58 mm.) and as usual the layout is as tight (some would say “cramped” as I could make it. The transistors used are based on Geoff Moss’ recommendations. I actually have some NOS 2N1711, but the BD139-16 actually measures better (higher hfe). The output devices are MJL21196 because I had them available and because the larger TO-264 package is nice. The board will be powered by a regulated PSU (hopefully ready shortly – the last parts are in the mail) based on a normal 3-pin regulator as shown in the 1996 JLH article (if all these references seem a bit like you have to be “in-the-know” to keep up, I suggest you start reading the pdf-articles here instead 🙂 ). A couple of my projects that are seeing some progress at the moment are my JLH amplifiers. The JLH1969 clone boards have come a bit further as I managed to fabricate/order most of the enclosure for them. Still to go is mounting a fan control board in the enclosure and then finishing up the wiring of everything. The PSU is a Mean Well 27V USP-350 which should be more than adequate for the job – let’s hope it sounds good as well. I had a few problems with getting the offset right but after some help from some nice folks at diyaudio, it turned out that it was just a wrong value for a trimpot. After than was fixed, the assembled boards are now playing in a somewhat improvised test setup (see pictures). The boards are of course not thermally stable in this setup, but it is enough to confirm that it is possible to adjust the quiescent current, zero the DC offset etc. and that they actually play music :D.
Next up is to figure out a suitable enclosure and drilling heatsinks etc. I also need to sort out a PSU for these and at least for starters I’ll probably try my hand at the capacitance multiplier circuit suggested for the amp. The JLH-amp, or more correctly John Linsley-Hood’s class A amplifier, is probably one of the most well-known designs in DIY audio. The original version was published in 1969, but that’s a little before my time. I first started reading about the design when Linsley-Hood published an updated version of it in the magazine Electronics & Wireless World in 1996. For me, the JLH is one of those designs that tick all the boxes (cheap, simple, good sound quality etc.) and I have been fascinated by it since I first read about it, but I never managed to actually build one. The first factor is Geoff Moss’s excellent “The Class A Amplifier Site” (TCAAS) resource, now hosted by Rod Elliot of ESP, that started around 10 years ago (ugh, how time flies!). The site collects a lot of information about Linsley-Hood designs as well as other well-known Class A designs from the likes of Jean Hiraga and Musical Fidelity. The second factor is the proliferation of extremely cheap ebay kits using the original JLH design as basis. Obviously, if you can get a whole kit for less than it would cost most people to manufacture the blank PCB, there’s really no excuse for not trying 🙂 I have bought one of these kits, substituted some key components (namely the caps and the output transistors) for some more “dependable” types (read: of less questionable origin) and mocked it up to see if it works. Below is the state of affairs at the moment, obviously not living-room friendly just yet, but it plays music! I’ve only hooked them up to my test speaker, but it is going to be fun listening to these once I get an enclosure ready for them. JLH board on heatsink for testing. It’s still not quite ready yet, but the PCB design files have been shipped off to manufacturing and should be back within a couple of weeks. More to follow when I have one assembled.